Some of the world’s biggest fashion companies are pledging to help rebuild Notre Dame after a devastating fire destroyed large parts of the iconic cathedral. LVMH also offered services from its creative, architectural and financial specialists throughout the restoration process. Meanwhile, Kering, the parent company of Gucci, Alexander McQueen, Saint Laurent and other luxury brands, pledged €100 million, or about $112 million, to restoration efforts. These are just a few of the major donations pouring in from around the world since Monday’s tragic fire, which ripped through the cathedral’s wooden roof and destroyed its iconic spire. Apple CEO Tim Cook also pledged a donation, along with other corporations, including Air France-KLM and the French energy company Total. French officials had feared Monday night that Notre Dame would be reduced to ash, but around 400 firefighters managed to save the structure before it was too late, TODAY's Craig Melvin reported from Paris. The interior was badly damaged but not completely destroyed, and several major artworks and relics were saved from the blaze, he said. 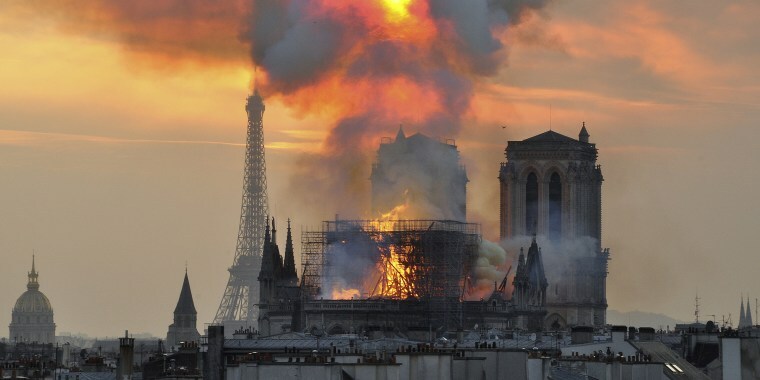 It’s too early to say exactly how much the restoration will cost in total, but in a televised address on Tuesday, French president Emmanuel Macron he said he hoped it could be done within five years. The massive donations pouring in from French companies and others around the world will undoubtedly help the repair efforts.